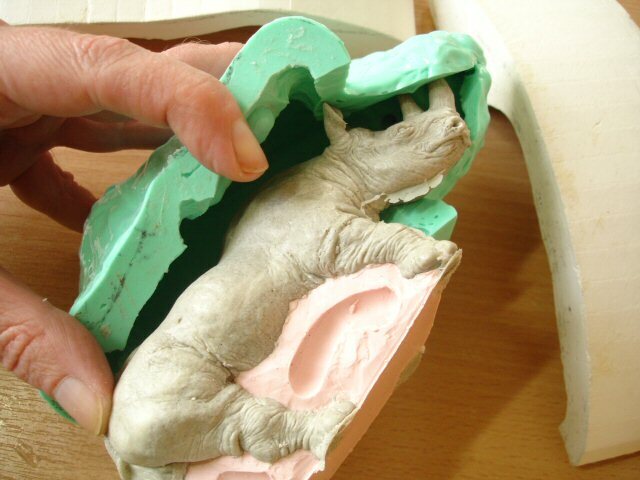 Here’s a method I’ve been rehearsing for a ‘simple’ 2-piece mould for a complete four-legged animal. 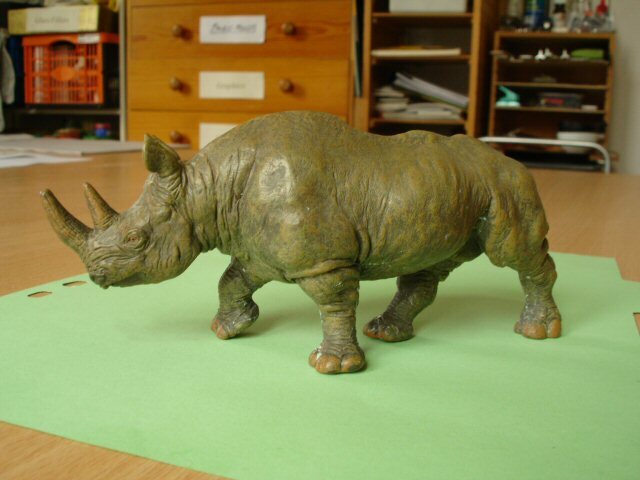 Since I have no small four-legged animals of my own at the moment I’m using a toy rhino. There are two main challenges with forms like this. 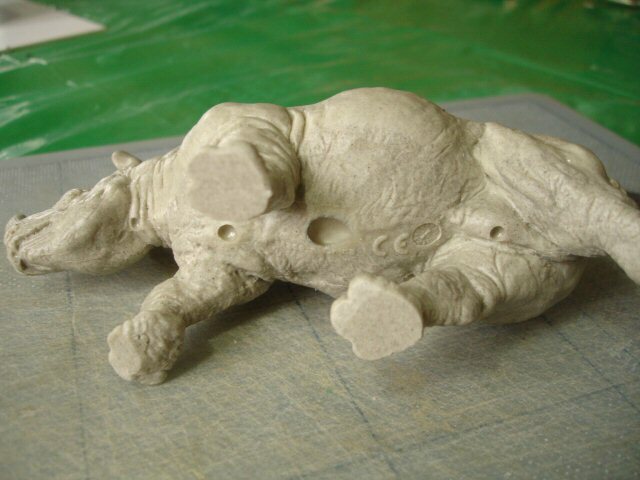 The first is the fact that the area between the four legs needs to be, somehow, a separate mould piece so that the mould can be taken apart and the casting extracted more easily. 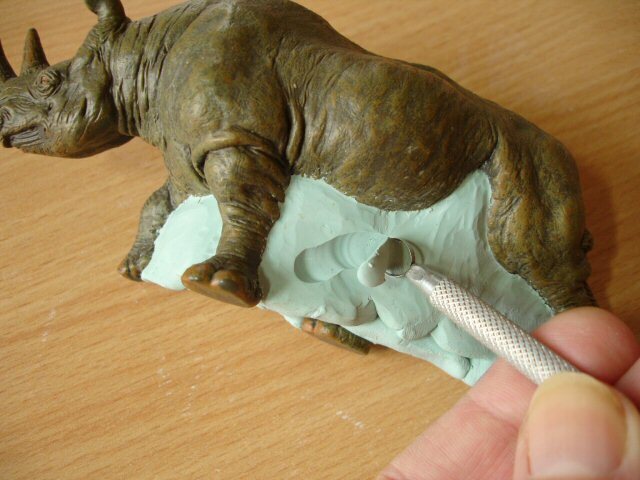 The second, especially in the case of this rhino, is ensuring (since the feet will becoming the pouring holes) that all the details of the head will be filled. Imagine the rhino form upside down and you may visualize how easily air could become trapped there, especially in the horns and ears. There are fairly simple ways of managing both these challenges. Here, above, I am starting to make a temporary ‘plug‘, filling the whole area under the belly out to a halfway mark along the thickness of each leg. I have used standard plasticine (‘Newplast’ brand in the UK) warmed a little with a hair-dryer, but any soft material can be used which is later easily removable from the prototype and is compatible in contact with standard RTV silicone. The plug is almost finished below. 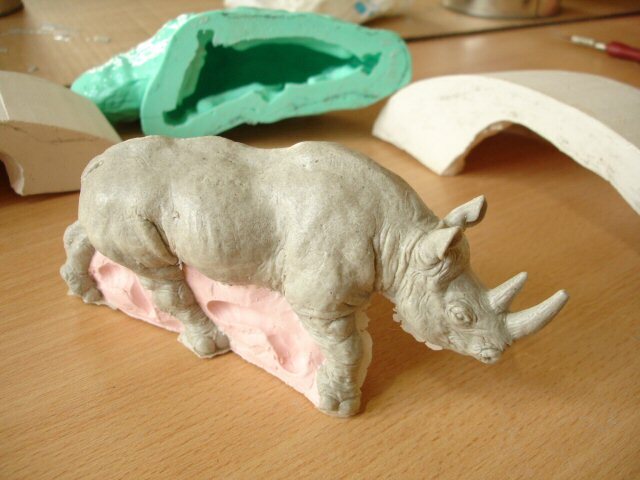 Note 2014 I used to use standard ‘Newplast’ type plasticine, common in the UK (in the long, cellophane packets) for all these jobs .. embedding prototype forms, building structures to contain silicone etc. There is a bit of a ‘myth’ handed down that only special sulphur-free types of plasticine are suitable for this. In the first place that might have been true in the early days of using silicone rubber. Nowadays this restriction only applies when using a special type of silicone known as addition cure which is affected by sulphur (see lexicon entry). In the second place nowadays fewer types of plasticine contain sulphur and the ‘Newplast’ type definitely doesn’t. Apart from occasional sticking of the plasticine to the cured silicone in places, involving just a bit more clean-up, there were no problems! Now though, I use a soft modelling wax called Terracotta Wax from Tiranti in London for all these jobs, in place of plasticine. It is much softer, easier to work with and parts more easily from cured silicone and prototypes. 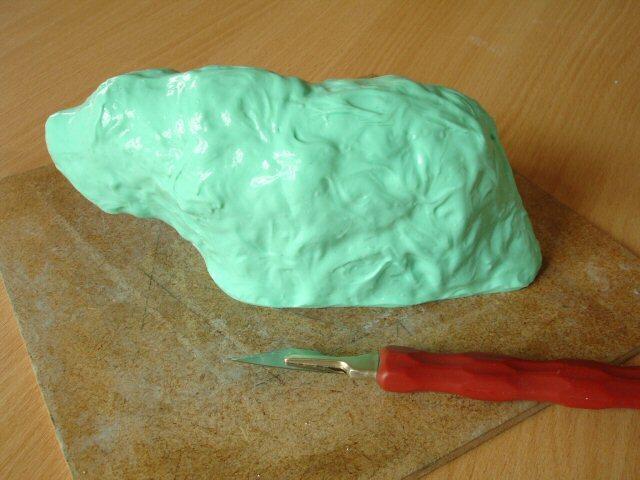 See the worklog section of modelling wax in the Materials section. This is the easiest point at which (before securing to a baseboard) to press in or cut locating ‘keys’ (otherwise known as studs or ‘natches‘) which will later be translated into silicone and help those parts of the mould to stay in place. Below, the plasticine plug has been neatened at the bottom, securing the whole thing to a baseboard (gluing the feet temporarily with UHU may help with this). Next the whole form is covered with a silicone skin (for this size 5-10mm thick will do, though I have gone a bit thicker in places). Usually one would convert a standard silicone rubber (normally pourable) to a ‘thixotropic‘ non-slump paste by adding a small amount of thickening additive. Here however I am using a special silicone rubber which is already like a thick gel ( Rhodorsil V1069) partly because I need to use it up, but also because I’ve become ‘fond’ of the smell of the catalyst which gives the air a definite Vim-like and minty ‘zing’! The silicone must be brushed on thinly and carefully at first to ensure that all surface details are captured. This first careful coat is often referred to as the impression coat or the detail coat. Brushes can be cleaned straight after use with white spirit. This first coat needs to be achieved fairly quickly while the silicone paste is at it’s most spreadable. Usually after about 30mins there is a slight but noticeable increase in the thickening but this helps because the silicone can then be more liberally ‘trowelled’ on to complete the thickness. Although the V1069 is a reliable silicone rubber to work with and easier to mix, there is an advantage to adding thickening agent to a more standard silicone because the percentage of thickener can be adjusted to fine-tune the behaviour of the paste .. i.e. adding a little less to keep the paste a little more fluid for longer, or adding more to force a quicker thickening. Below, the silicone has cured (on average overnight) and I have trimmed the edge on the baseboard. For this mouldmaking method, sometimes known as ‘split skin‘, everything is covered first and the silicone is split or divided afterwards. Unless it is very thick (which would be uneconomic since silicone rubber is expensive) the silicone mould needs some help in keeping its shape later. Obviously this has to be done while the prototype is still inside so all is left exactly as it is for the moment. Common practice with larger forms is to make a rigid casing directly on the silicone using fibreglass or reinforced plaster. 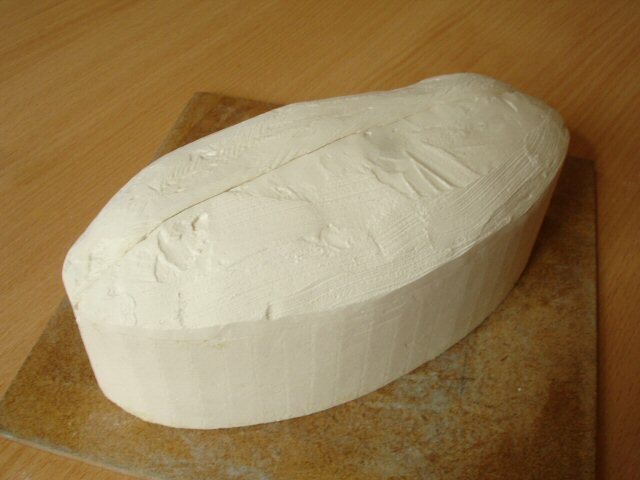 I am using plaster here, to make a casing in two removable halves. The best way to do this is firstly to build a smooth dividing wall of plasticine which bisects the form (omitted in the following .. I didn’t take photos of this for some reason). 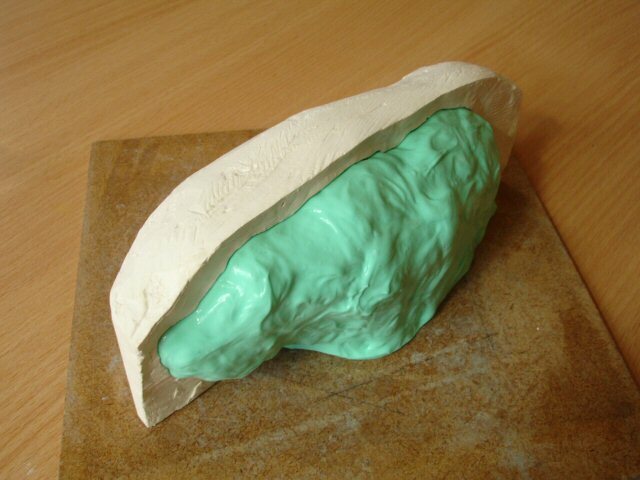 What is shown below is the plaster jacket completed on one side, made by partly pouring/partly sculpting the plaster on up to the plasticine divider (plaster goes through a very brief paste-like stage during setting when this can be done quickly). Once set the edge of the first plaster half must be thoroughly Vaselined to prevent the second plaster half from fusing to it. This half is then done in the same way. The two plaster casing halves shown have been cleaned up a little (with rasps or coarse sandpaper) because ragged plaster edges are uncomfortable to handle, and can even cut the skin! This plaster mould casing, or jacket, is also often referred to as the mother mould. It usually has to be in more than one piece .. otherwise, and certainly in this case, the silicone part could not be removed from it. 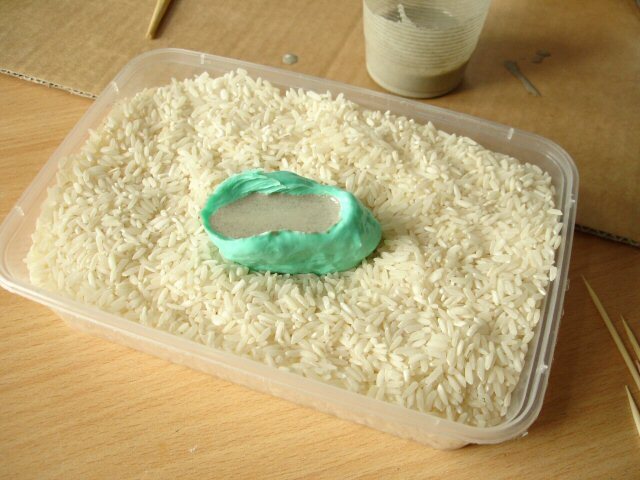 Next the whole setup (plaster jacket, silicone, prototype within and plasticine ‘plug‘) needs to be detached from the baseboard and turned over. Most often a simple press-and-twist of the whole setup is enough to free it from the baseboard. 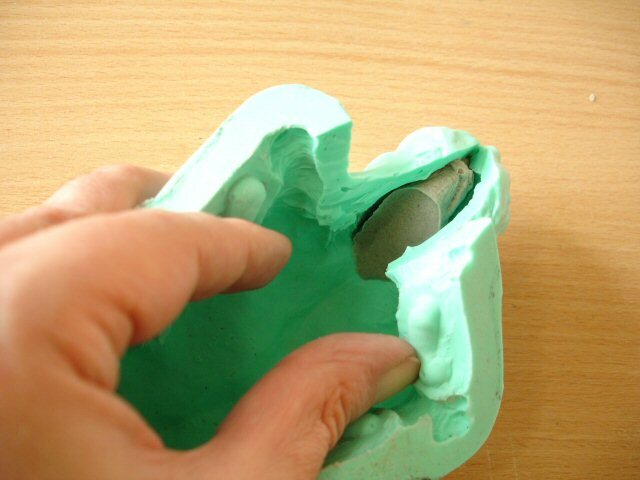 All the plasticine can now be removed, meaning that the space occupied by the plug now becomes a void. 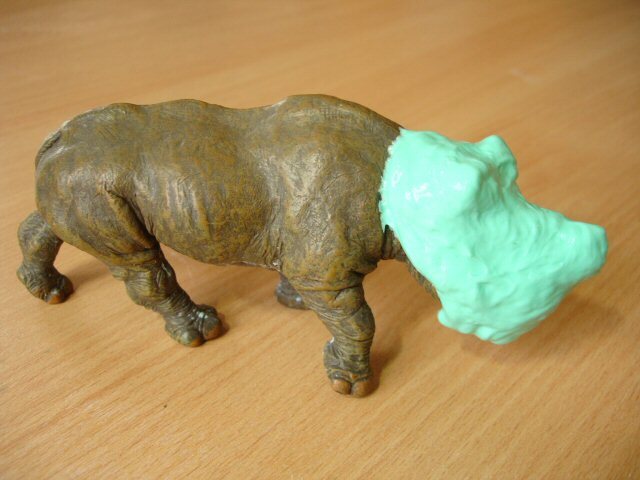 In this case the plasticine was very easy to remove. Silicone rubber doesn’t normally stick to it and there was only a little cleaning up to do on the underbelly and legs of the plastic prototype. Now this part of the mould is almost ready for filling, with pourable silicone this time, to ‘re-create’ the plug as a separate silicone piece. Almost ready, that is, apart from the crucial step of ‘greasing’ the void with Vaseline to prevent the new silicone addition from sticking to the previous. In the photo below I’ve bound the plaster halves together and set the mould in a bed of rice so that its top edge can be adjusted for a true ‘water’ level. If this is not done the liquid silicone would not fill the void completely. I’ve chosen to use a slightly softer silicone for the plug than the outer skin, because during demoulding the plug will have to squash/flex a little more than the rest. The V1069 (green) has a Shore A of 30, whereas the Lukasil 429 (pink) has a Shore A of 20. In an overall Shore A scale of 0-70 this does make a significant difference. The photo below shows the void filled, waiting for the silicone to set (again at least overnight, or 24hrs as recommended by the manufacturer). After this has cured it means that the whole prototype form has been moulded and it is safe to start dismantling the whole thing. 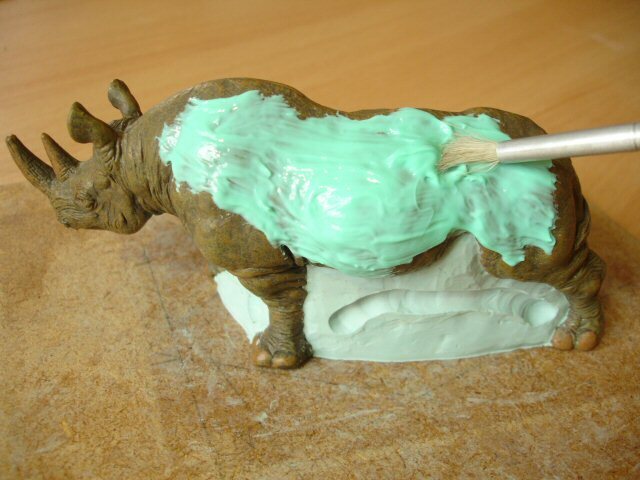 Remember that the first (green) silicone skin was applied around the whole rhino form (except the underside masked by the plasticine) but it would not be possible to simply remove the prototype (or future casts) from this silicone skin as it is, because of the strong undercutting (jutting out) of the head part. The silicone skin must first be split with a sharp knife, just up to the point where the head can be eased out without much strain on either the form or the silicone. Although silicone can be very flexible there are some limits. If the mould parts are put together again with care and the plaster jacket is firmly in place the two parts either side of the cut will ‘find themselves’ again and may not even create any noticeable seam line on the cast. If in doubt and as an extra measure the cut can be cemented with a little Vaseline (or even .. just a passing thought, though I haven’t tried it yet.. denture paste!). But Vaseline is tried-and-trusted .. it not only seals the join better against possible resin leakage but it helps the split silicone even more to find its join again. 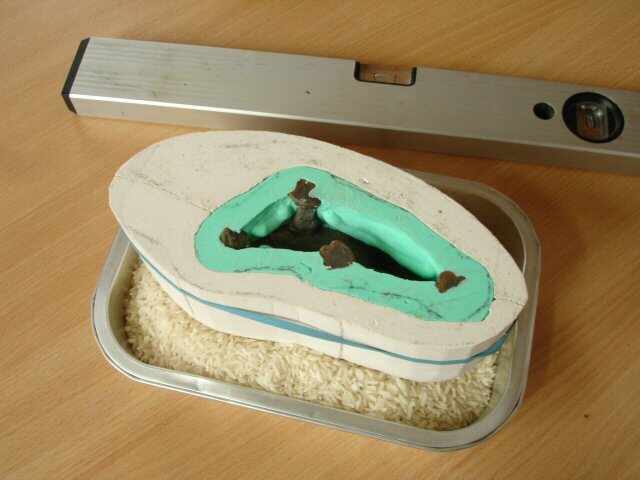 The separate mould parts are displayed below (with the softer plug shown re-fitted back onto the prototype for the moment, hopefully to make it clearer) and then the mould assembled as if ready for casting. 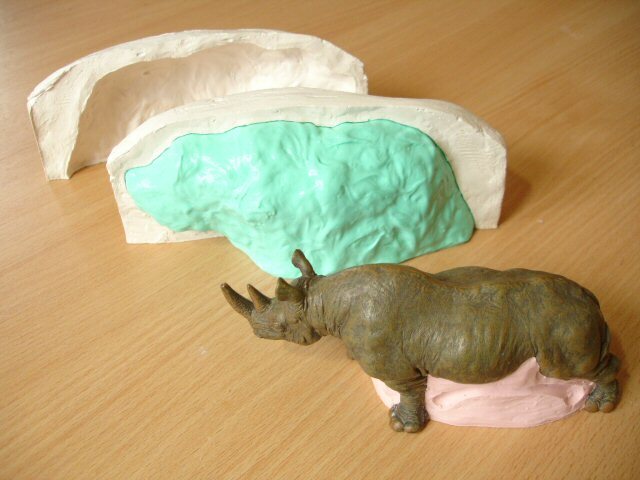 I should mention that there’s something of common practice that I haven’t done here, and that is to include pouring cones (or funnels, or ‘reservoirs‘) in the design of the mould, which would have been built at the plasticine stage. Since it will be an easy pour .. the pouring holes are accessible, the resin will be thin .. these are not so necessary here. I had mentioned at the beginning that there were two significant challenges with this form, the first being the space under the legs which has been solved by creating a separate plug in silicone. The second is the inevitable problem that, whichever casting material one chooses, the chances are that the head will not fill properly especially considering the relative slenderness of the horns and the ears. There are just too many places where air can get trapped. The traditional solution for this is to cut thin channels in the silicone leading from the outermost points of the horns and ears to the outside of the mould so that the air can escape that way. In the first place this may not be so easy with a split skin mould of this type and in the second place I wanted to try another idea. 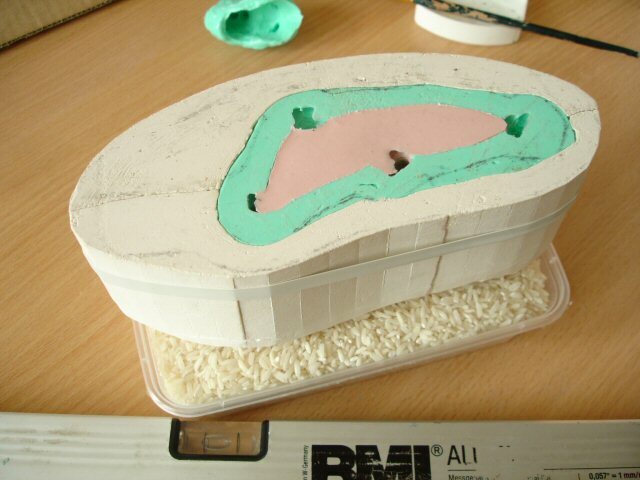 Here I have made a separate mould just for the part of the head that would cause the problems. I intend to make a resin cast in this and then insert this pre-cast part into the larger mould which can then be filled as normal to make a complete cast. This technique of casting in stages .. let’s call it additive casting for want of an established term .. works best when working with resin because this usually binds strongly to itself. It doesn’t matter how much time intervenes between pouring the different parts; it will still fuse. Resin was also necessary for this form because it is a relatively small size, and the horns and ears could be especially fragile. 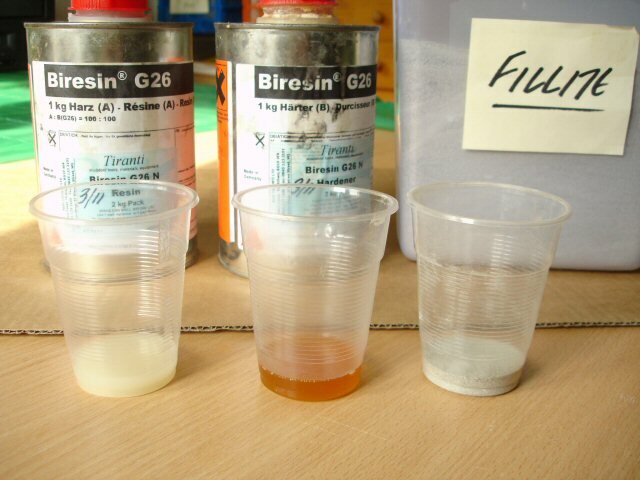 I am using a standard, low-viscosity (thin and flowing) polyurethane resin from Sika called ‘Biresin G26’. Most polyurethane resins are reasonably thin and can flow into quite intricate moulds. Most also share the following characteristics: they are supplied in two parts which are mixed in equal measure usually by weight; these two parts are usually translucent until mixed, turning opaque as they cure to anything from white to beige dependent on the brand; initial hardening is quick (5-20mins); they are strong when fully cured but rarely brittle, retaining a little flexibility (some brands more than others); they can easily be coloured or filled with other materials. In fact it is common to add a filler to resin, partly to economise. For this exercise I am using a specially manufactured ash called Fillite, a certain amount of which can be added to the resin without making it difficult to pour. It also gives it an interesting surface quality. Many powdered materials (such as talc, marble or slate dust) can be used as fillers as long as they are inert i.e. not affecting the chemical reaction which has to take place for the resin to cure. The photo above shows equal amounts of Parts A and B of the polyurethane resin measured by eye in disposable plastic cups. The same amount of Fillite (light grey) is also portioned. I have found that this proportion, in total 2:1 resin to Fillite is best if one still wants the mix to flow. One can add much more filler to the resin if one wishes but this results in a thicker mix which is more suitable for spreading than pouring. This for example might be ideal for laminating, that is, building up a shell inside the mould parts in order to make a hollow cast instead of pouring a solid one. Note 2014 I’ve already said that polyurethane resin parts ‘A’ and ‘B’ are commonly mixed by weight rather than volume, but for many years I mixed Biresin G26 by volume and eye in the way shown here, with no obvious problems. This is because the two parts have a similar relative weight or SG .. ‘specific gravity’, which is written as the weight in grams of 1 cubic centimetre of the material. Part ‘A’ has an SG of 1.00, while part ‘B’ has an SG of 1.15. In other words part ‘B’ is 15% heavier as a material. Therefore if portioned by volume as above there is actually 15% more hardener than there should be. On the whole, as I say, this had no noticeable effect using this particular resin .. except that, in retrospect, I did have the problem occasionally of greasiness on the casts which I now know is caused by a surplus of hardener in the mix. Another consequence would be that the hardener runs out before the other resin part .. something I didn’t really notice because I always had a few cans of each on the go! As a rule nowadays I always mix by weight, using a digital kitchen scales, unless the manufacturer’s guidelines suggest otherwise. The Fillite must be mixed into one part of the resin (Note 2014 I see that I’ve mixed it into the hardener part ‘B’ here, which worked fine, but I now know that it’s better to mix it with the resin part ‘A’) before the two resin parts are mixed together. This is because once the resin parts are mixed the time available to pour is very limited, basically just a couple of minutes. 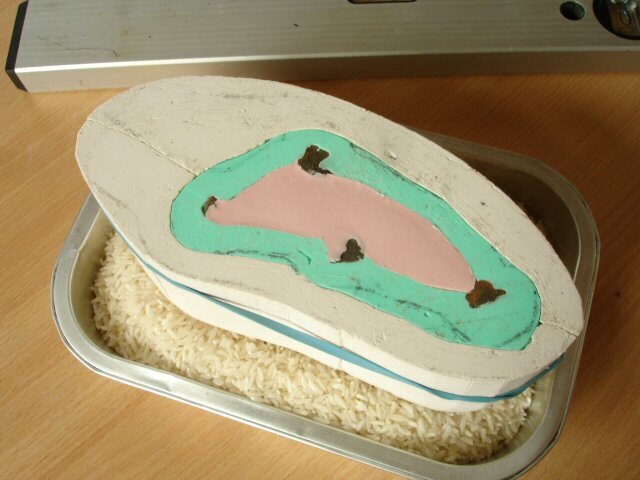 In the photo below the small head mould is supported on a bed of rice (so that its position can be easily adjusted). Working quickly, a little of the resin mix was poured into the recesses of horns and ears first and a cocktail stick poked around to displace trapped air, then the rest was poured. It is difficult to mix very small amounts of resin properly, particularly if there are three parts to the mix so I usually mix up larger, more measurable amounts and, if there’s time, use the excess for filling something else. 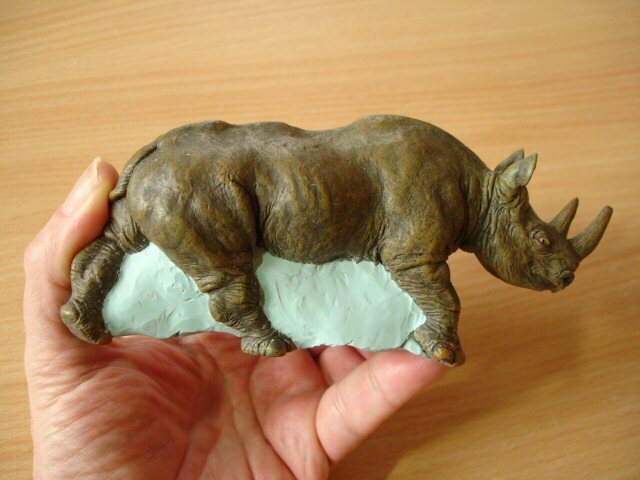 Above, these details on the rhino head (especially the ears) would never have filled properly if pouring the whole form from the top in one go. Small castings in resin may take a little longer to cure (the standard term for setting by chemical reaction rather than hardening simply by evaporation of water) since the greater the volume of resin the more heat is generated, which in turn accelerates curing. Large resin casts (whether polyurethane or polyester) can become extremely hot during this process! Above, the head portion has been eased into its position in the main mould part. It will of course fit snuggly since it’s the identical form. When the mould is reassembled and secured tightly more resin can be mixed to fill the rest of the form. As long as the same proportion of Fillite is used the colours will match and the join should be invisible. It doesn’t matter how fully cured the head portion has become in the meantime; the new resin will bind firmly to it. Below is the mould set-up ready for pouring, couched on a bed of rice so that the mould top can be checked with a spirit level and adjusted. Since I have not incorporated pouring funnels etc. in this particular case, an extra precaution was to grease the plaster part of the mould top with Vaseline so that in the event that resin overflowed it could be more easily peeled off once hardened. 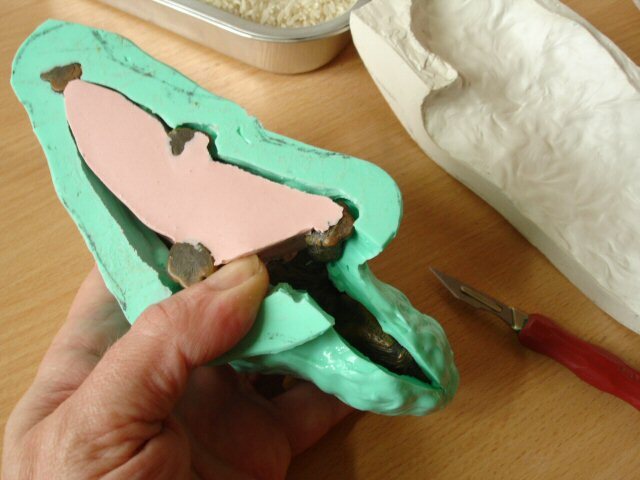 The form was carefully demoulded (taken out of the mould) after about 20mins. The plug was kept in place untill last, partly to protect the legs which would be in a slightly softer state than the body untill fully cured. Full curing of resin varies with type but can usually take a few days even though castings can feel hard to the touch much sooner. However well-fitting the mould pieces might be there will always be wafer thin ‘flashing’ where the resin has seeped into the mould seams. Polyurethane resin cures very quickly and can often be safely demoulded after about 15 minutes, though various brands may differ if they’ve been developed for a specific use i.e. hollow casting. With most there is a so-called ‘green stage’ fresh out of the mould when the resin should be firm but still a little rubbery. This is the best time to trim or sand away such things as seam lines .. sometimes the flashing is so thin that it can be removed with the fingernail. 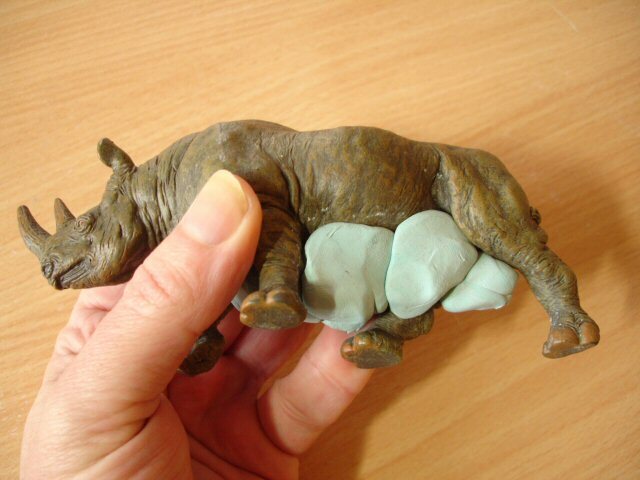 Below, if you imagine the rhino form feet-up and as a hollow cavity which is gradually filled through one of the legs, the liquid resin rises comfortably until it gets to the belly which becomes a ‘ceiling’ to the cavity. Air can easily get trapped here as it can no longer be pushed so easily upwards, unless it’s underneath one of the legs. A certain amount of rocking and tapping while pouring can help a lot but may not get rid of all. 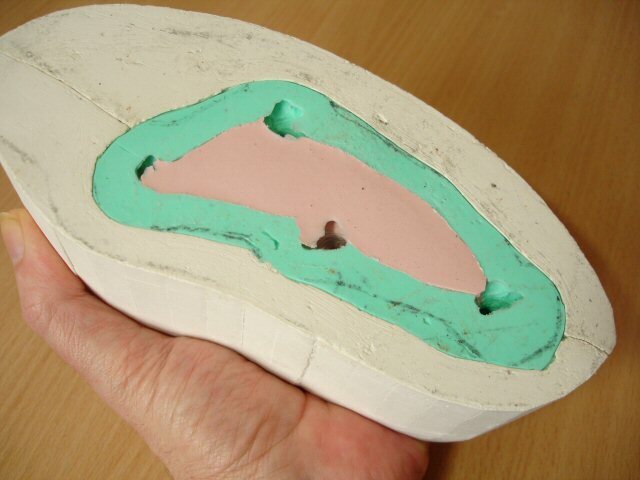 Often a channel would be drilled in the silicone plug (the pink part here) from the problem area to the outside top of the mould, to allow air to escape. Normally a test cast is made (or a few) to locate these problem areas first. Otherwise, a little more of the resin/filler mix can be made and the holes patched up, then trimmed or sanded. Polyurethane resin can be tooled (worked with power tools, carved or sanded) very easily, especially if a lightweight filler such as Fillite has been added. Finally below, the finished cast (with the original behind it). I’d mentioned above that the Fillite gives the resin mix a sympathetic colour (which is also slightly speckled). This is one common purpose of fillers (especially marble or slate dust), to impart an appearance of other materials. But resins discolour in time; the UV (ultra violet) component of daylight causes yellowing. This is noticeable even if a filler or pigment has been added. In the case of polyester resins a UV blocker is available which can be added to the mix to prevent this. So far I don’t know of any equivalent additive for polyurethane resins. What this means is that if any permanence is needed for the surface effect polyurethane resin needs to be painted and, common to all plastics, that can mean quite a bit of preparation especially if the form will be handled. Painting is another subject in itself, which I will probably deal with at some point, but for the moment.. the polyurethane cast should ideally be given a few days to fully cure, after which it should be carefully scrubbed in warm soapy water. It is better still to use a scouring powder which will make the surface ever so slightly rougher and more paint- receptive. Lastly the form needs a good priming coat using a spray primer, the best of which, in my opinion, is Simoniz Acrylic primer. The most reliable, hard-wearing and versatile paints I’ve found, all of which are suitable on plastic if primed, are; Humbrol enamels, Rosco ‘Supersaturated’ scenic acrylics or Osmo oil/wax wood paints. I am sculpting marionettes and the final casts will need to be painted and also need to be able to be handled. The different body parts will bump against one another and rub against the strings and controller, etc. I’m an experienced mold maker and resin caster (I’m currently using Polytek resins, both clear and white) and my supplier said to go easy on the “B” if it is to be painted. Was he wrong? I’m powdering the molds and will try sanding the casts, but there are fine details in the faces, hands, etc. I’m having a horrible time sorting out the painting and am tired of shelling out money for paint that is yielding poor results. In fact, I’m thinking of switching casting materials altogether, if I can think of something more suitable. No, I’m afraid no advice for getting a really hard-wearing finish! PU resin needs to cure properly (taking a few days); then degreased (water and detergent); then primed with automobile primer; then can be painted .. toughest I know is Humbrol enamel. If this is coated with a good polyurethane varnish (gloss, satin or matt choice) then this is strongest .. but not like ‘baked on’! I’m surprised about this. I’ve done it a few times successfully myself and when I’ve recommended it during my courses it has also worked .. no failure of the final pour to fuse with the pre-cast pieces! It may be down different resins we’re using .. which of course doesn’t help you much. Smooth-On products have a fairly good reputation, but here in the UK they’re too expensive to be worth it. By default I use either a Fast Cast PU resin from Tomps or BiresinG26 which is made by Sika. Both are very low viscosity and designed to cure properly even in very small amounts or thicknesses (whether or not that has anything to do with it). Another difference though is that I almost always add a filler called Fillite to the resin (similar to a volcanic ash such as Perlite). I almost always add a third by weight of mixed resin, which doesn’t affect the resin’s flow. It may be this addition that (for some reason) prevents de-lamination .. but I don’t know. I learned quite a lot from reading your blog on making a mold. I am disabled and live on a very fixed income so I’ve been considering making some large molds (of goats) and then pouring them up with some type of heavy material for outside use. These past few years have really ramped up with the sale of “goat” items…so I’m hoping I may be able to sell some yard decor of goats. I want to be able to use a material that is paintable, so the buyer can paint it to their liking. This entire desire of mine is new to me, I don’t know anything about it…but I am willing to learn through trial and error. Thank you for you info on the post, it’s greatly appreciated and needed! God bless you and yours! Polyurethane resin is not harmful .. as long as there is reasonable ventilation and air circulation so that any fumes are not allowed to concentrate. A respirator mask is not usually used ( unlike with polyester resin, a different matter). Thank you so so very much for this blog and the useful information you provide here. I am an artist hoping to create an installation consisting of several small model goats and in searching for help online, I came across this post. It is just what I was after – really thanks so much! I don’t know if it might be possible to ask a few questions in regards to my project? 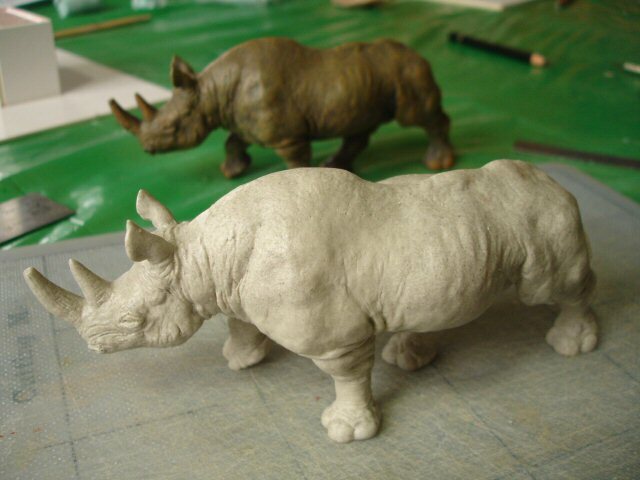 I am not very experienced in mould making and casting. I am really sorry to ask and of course understand if not possible. I am just keen to figure out exactly what I need to do before buying resin, silicone etc. as I am on a tight budget and don’t want to purchase the wrong thing! You’re welcome to ask questions. My time is rather limited at the moment though, so if the questions can be covered with short answers that I don’t have to think about too much I’ll see what I can do. Thanks so much – sorry I am sure you are very busy! I have placed an order for Fast Cast Polyurethane Resin, RTV Silicone Thixotropic and Value BUDGET RTV Silicone from Tomps. I think these are adequate for making my molds and casts. I just wondered whether regular plaster could be used as a ‘filler’ with my resin, or would I need to purchase a specific brand? Sorry to ask and many many thanks. Thank you again for all the information on the website – it is extremely comprehensive and I have found very useful 🙂 All best wishes. The materials you’ve bought from Tomps sound right. I assume though that you’ve bought both a pre-thixotropic silicone together with a regular one to make it less complicated when working with each? Usually one can buy a separate thixotropic additive to make a regular silicone thixotropic, but this requires a finer dosing procedure. I’ve been asked the question about using plaster as a filler for resin before. It’s not common practice, and up to now I’ve advised against it for two reasons. Firstly plaster is ‘hygroscopic’ meaning that it absorbs atmospheric moisture readily .. this means that however well it’s stored it will contain some moisture and when mixed into polyurethane resin it will cause it to foam and expand. This won’t be a lot, but it can be up to a third of the volume. It can become an advantage, saving on resin .. but the part of the resin that’s foamed (the upper layer) could have a slightly different appearance when set and will react differently to sanding. It’s also assumed that adding plaster to PU resin will lighten it in colour .. strangely enough it’s the opposite, it makes it slightly darker or ‘dirtier’ looking. 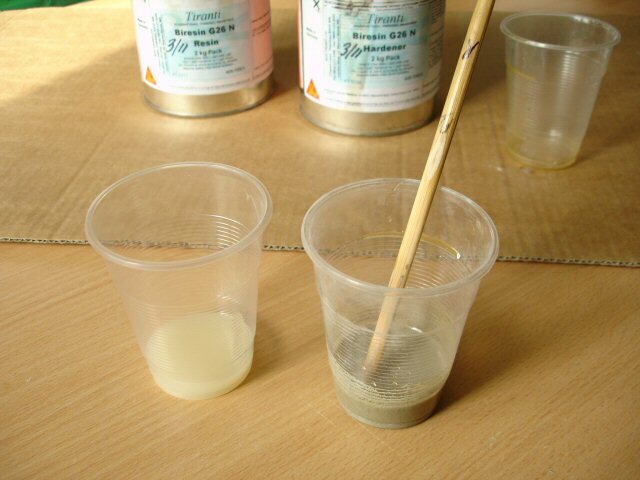 The second reason against it is that whereas other more common fillers are designed not too change the viscosity (and hence the pouring ability) of the resin too much, plaster will thicken it more so one needs to be careful how much one adds especially if the mould is detailed or intricate. Every case is different, so in each case one has to do tests to find out what will work or what one can get away with. 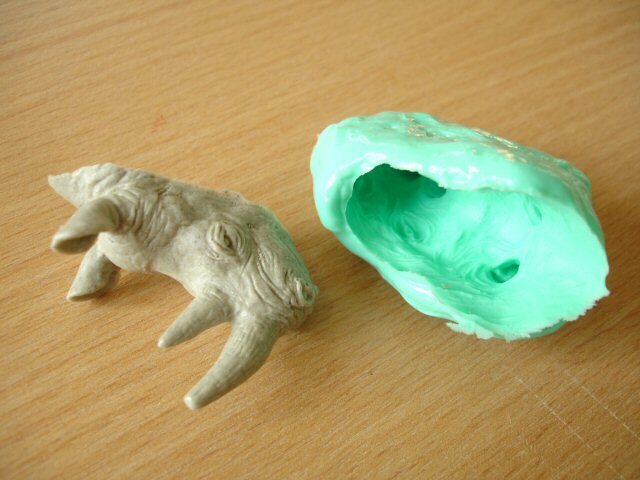 I’ve just done some tests using Tomps Fast Cast and Crystacal R (a fine casting plaster). I mixed in 30g of the plaster first in 15g PartA of the resin and it took quite a lot of thorough stirring to get rid of the lumps, but it was possible. For this reason it’s essential to mix plaster with one resin part first (rather than mixing resin parts together, then adding the plaster .. there’s no time for this!). On mixing in the remaining 15g PartB I’d say the mix remained surprisingly pourable .. so I’d recommend the ratio of 1:1 by weight total resin to plaster. But as I thought, it foamed to about a third more it’s original volume. I’m continuing these tests and will hopefully be able to write up the results as a post today or tomorrow. At least I know now that PU resin will ‘cure’ normally when plaster is added (I wasn’t convinced about that before) and I would imagine this would go for any type/brand of white plaster whether marketed as ‘Plaster of Paris’, ‘casting plaster’ or ‘modelling plaster’ etc. What an excellent tutorial David! Invaluable! You should offer workshops I think they would be very well attended-thank you so much for taking the time to write this and help people! Thank you .. yes I do, and they usually are! Excellent tutorial David-thank you so much for taking the time to plan,write, photograph and upload this-I am sure it will be invaluable to many! fantastic , could you produce a silicone mould for me ? In theory, yes .. but not this year! The earliest I can take on other things would be January onwards. You can send me an email (see the end of the ‘About’ page) with more details. You have just no idea how helpful and informative this was. Great piece – I am new to casting, and am just so grateful someone like you was willing to write this. Thanks!! Many thanks Robert! Actually I do have an idea .. that’s my job, and my purpose here .. but it’s good to hear it from you! Such a great tutorial, hope you dont mind me asking but if I need to sculpt the subject first is there a particular Clay/sculpting material you would recommend?